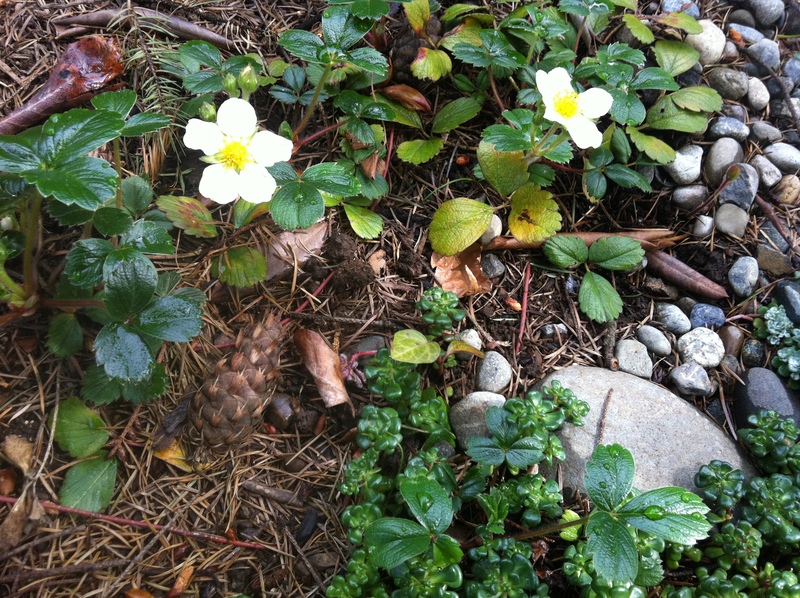 Woodland garden – alpine strawberries in bloom, next to Oregon sedum. 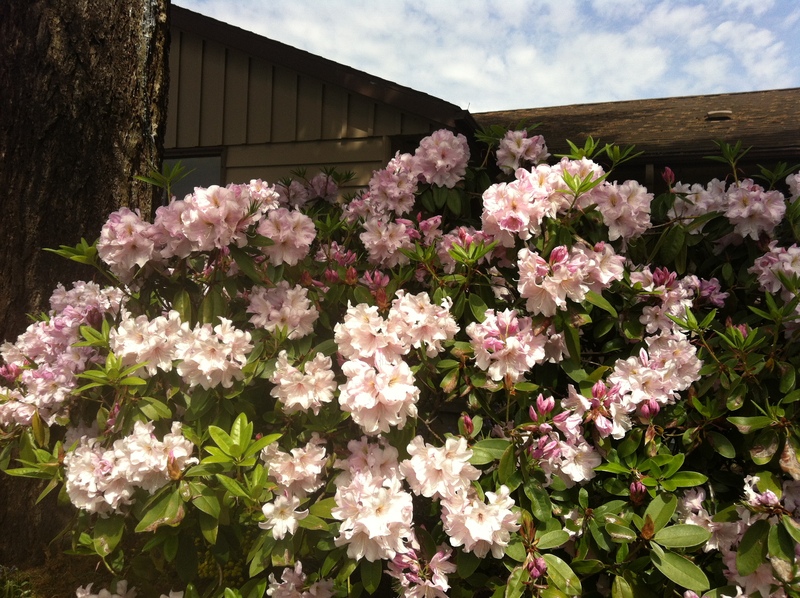 Front yard – Rhododendron in bloom. 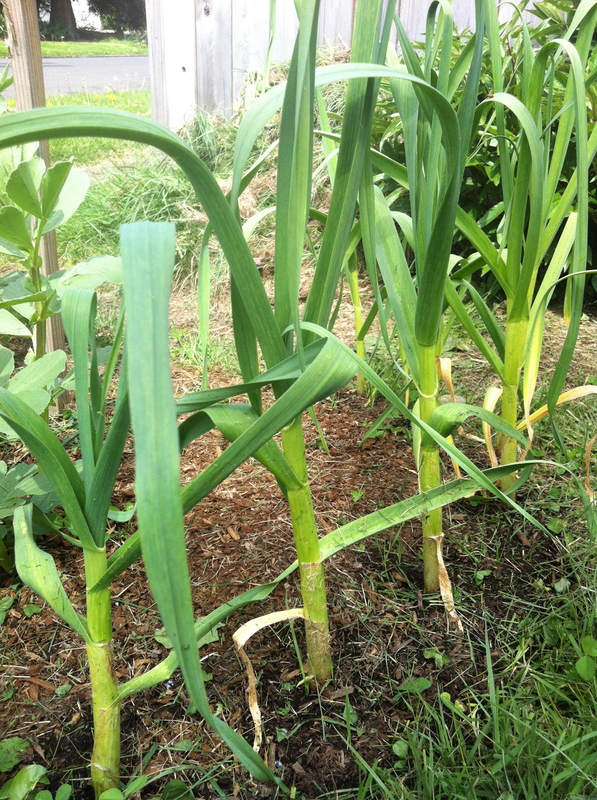 Garlic in The Orchard is coming along. Thicker stalks here than in Bed 1. Bed 2 – crazy town. I’m trying the forest garden method. Different heights for shade where needed. Diversity to trick the pests. 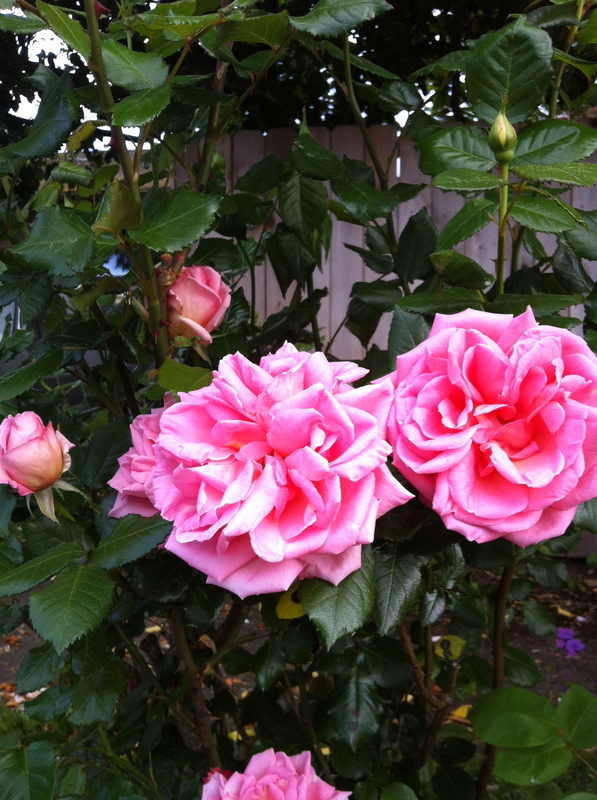 Companion plants to boost production. 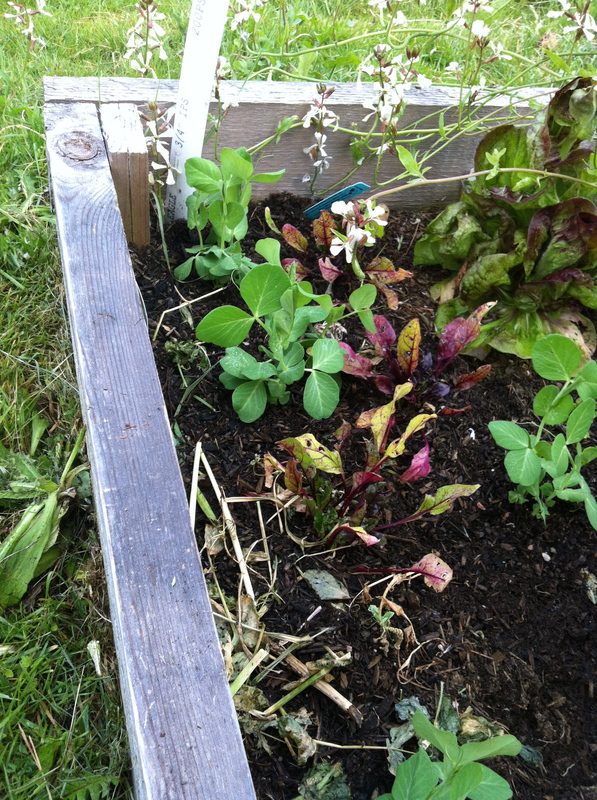 Bed 2 has new oregon sugar beans, beets, arugula that self sowed this winter, leftover radicchio from last year, and some new mustard greens to break up the soil. Bed 3 – ready to go. Last week I chopped down the cover crops and today covered them with a layer of compost. 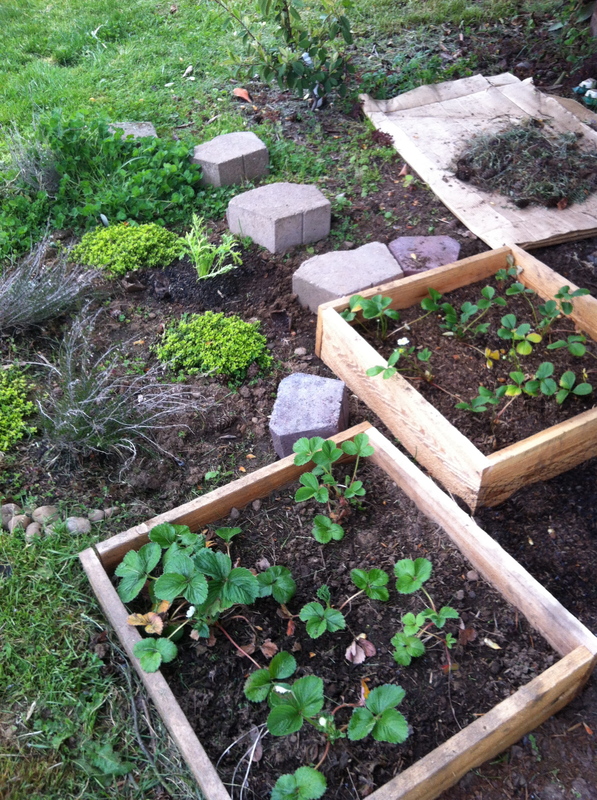 I’ll give it a few weeks to settle down, then plants my tomatoes in this bed this year (last year was unsuccessful brassica bin – planted too late, poor irrigation, unhappy plants with aphids). I’ve set out some marigolds and nasturtium. Also purchased some new irrigation tools today. Wine bottle will have a ceramic bottom (Recycle a Bottle Plant Nanny). I’ve also ordered four Ollas to irrigate the ground below the soil level. Favas! Love these. 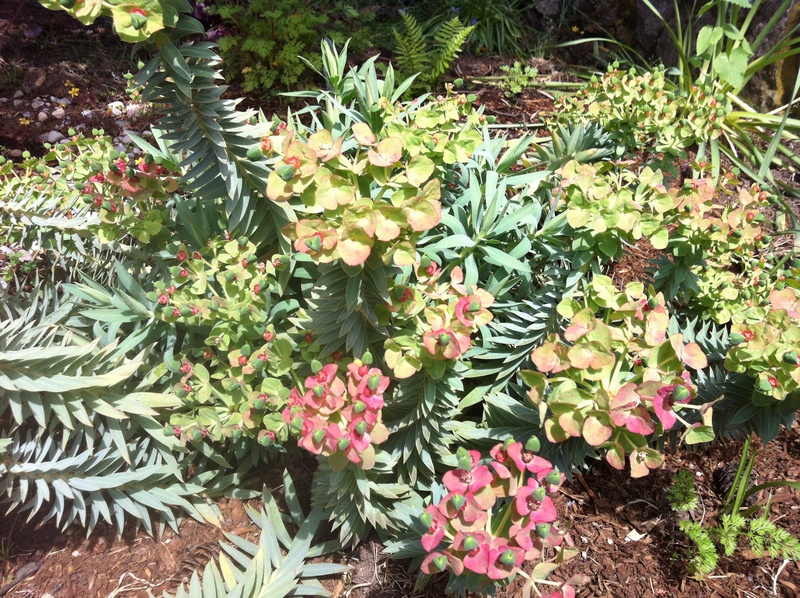 And several of my elderly neighbors have asked curiously what they are. They look great, smell amazing, and I can’t WAIT to harvest the beans. The Orchard – Liberty apple tree. 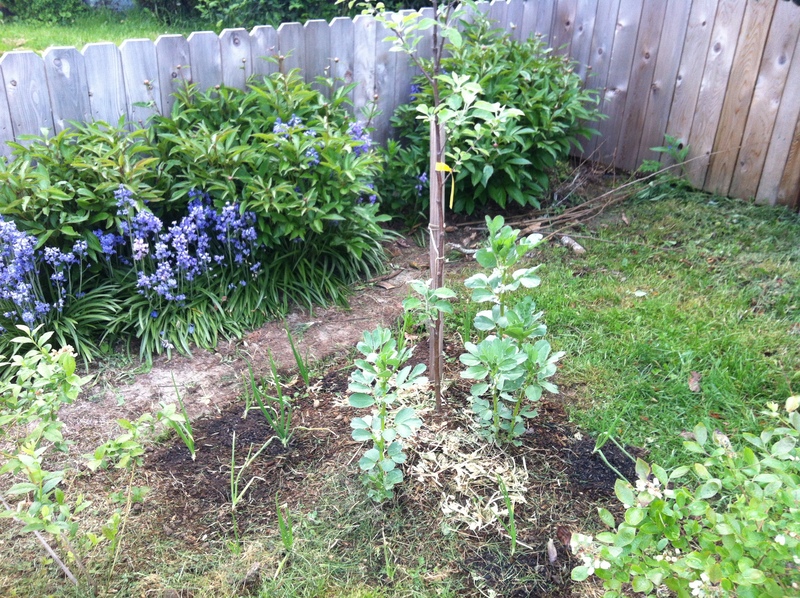 I’ve moved the onions here from Bed 4 (favas). 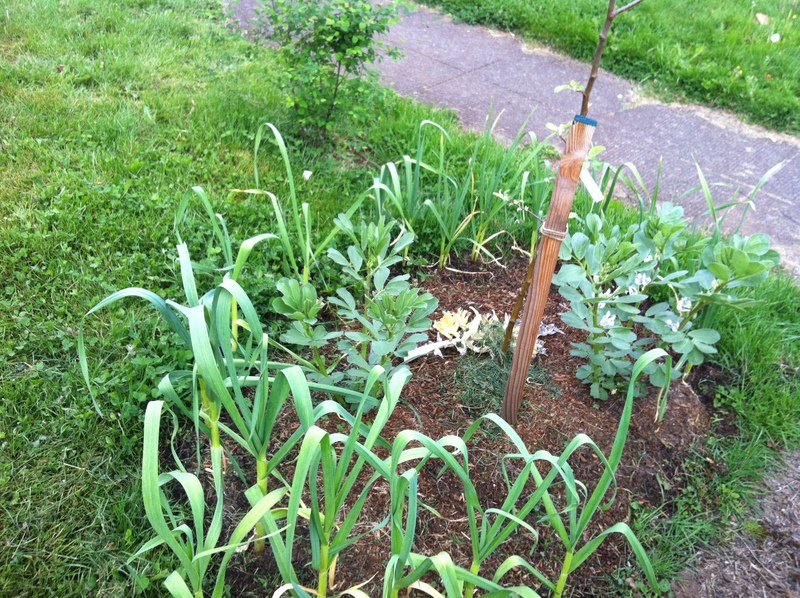 I learned yesterday that onion family plants can stunt the growth of beans. Yes, those are favas over here, too. 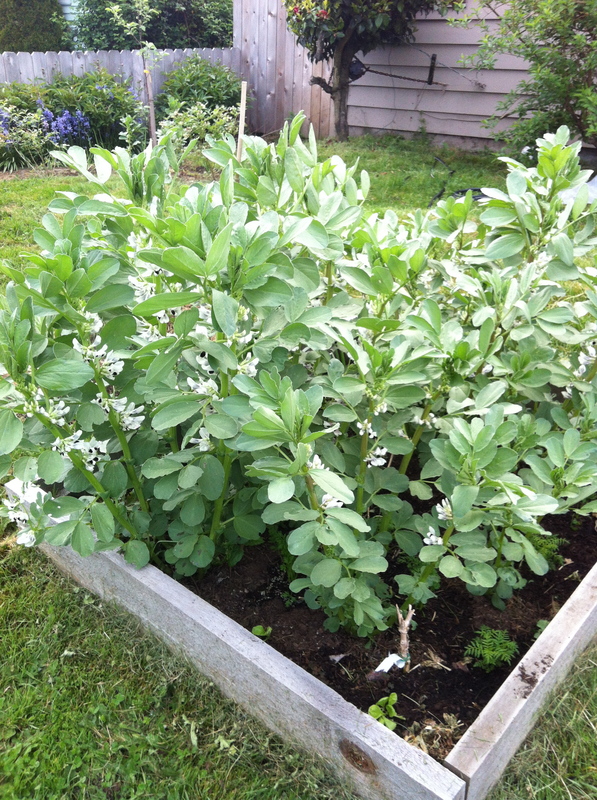 But they are nursery favas, just to help the ground. The Orchard – Fuji apple. Surrounded by garlic. 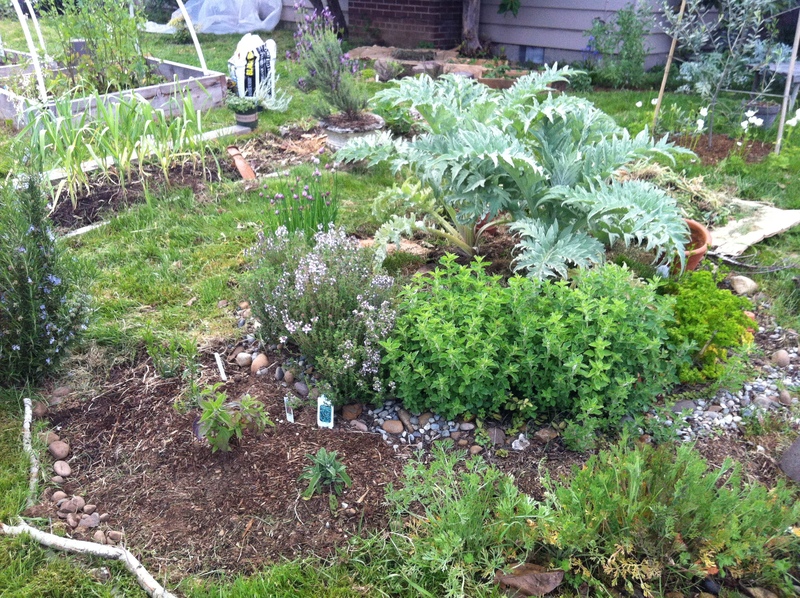 Perspective of the Herb Garden. 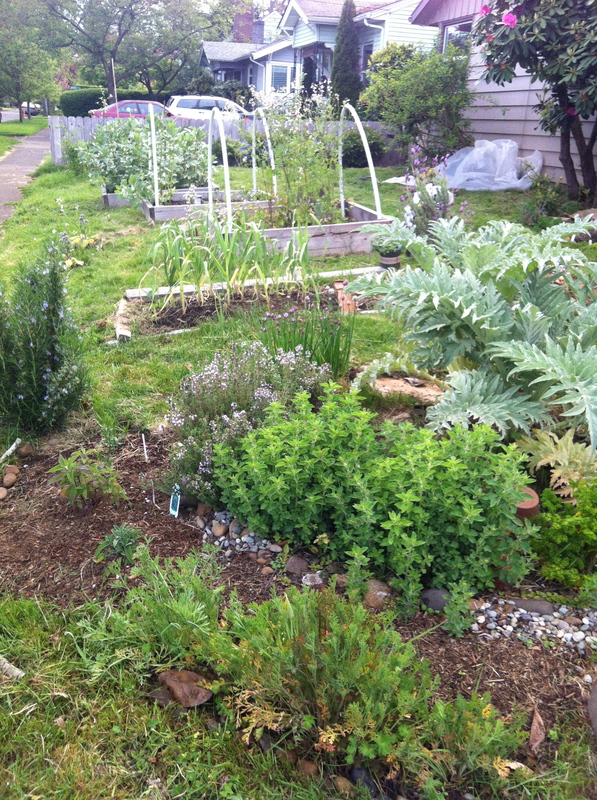 The oregano and thyme in the front has really matured. My artichoke drops alot of leaves – hope to figure out how to make it happier. 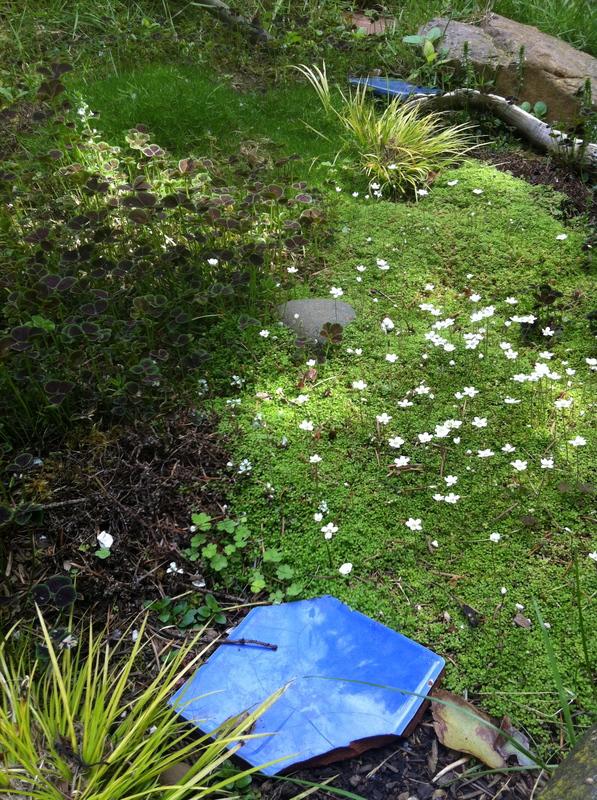 Also, yesterday I planted some German Chamomile behind the oregeno. Would be amazing if it takes. Perspective of the whole side yard. This was a blank slate a year ago. It finally feels like something.